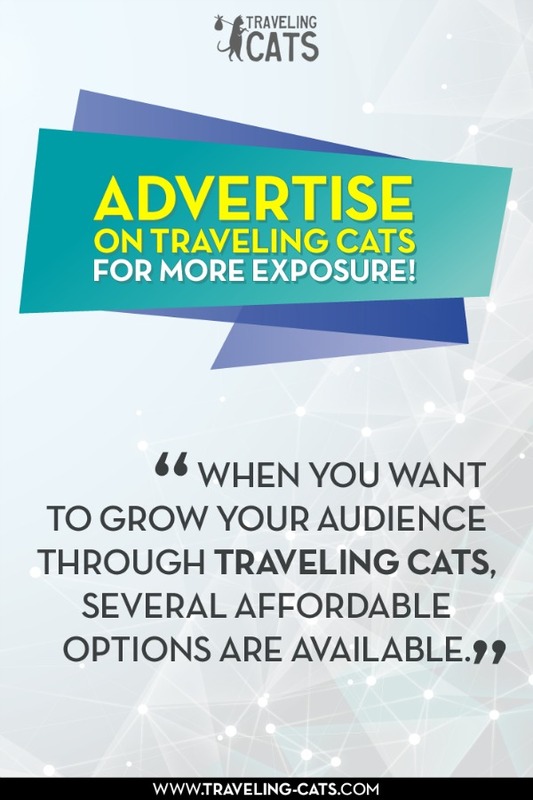 Advertise on Traveling Cats for more exposure! When you want to grow your audience through Traveling Cats, several affordable options are available. We love to pamper our advertisers, so let us know if there is anything we can do for you to help you reach your commercial or blogging goals. We will promote your website, product and/or service on Traveling Cats' social media accounts (Facebook, Twitter, Pinterest, StumbleUpon and/or Google+) with a link back to your website. We will display your 300x150px banner in the Traveling Cats sidebar. We will publish a post, written and photographed by you. This is a great way to promote restaurants, cafés, hotels, or B&Bs with resident cats. We only accept posts that fit within the Traveling Cats format. Both pictures and text need to be of good quality. Are you the PR representative of a city or country with lots of cats? Do you own a hotel, B&B, café, restaurant, or shop with resident cats? We may go on a press trip to promote your business or area. Please note that all our travel expenses should be covered. There is no better and more authentic way to promote your business. Why work with Traveling Cats? Traveling Cats is one of the most popular cat destinations on the Internet. It has a very engaged, worldwide audience, with top 5 visitors coming from the USA, Belgium, Canada, United Kingdom, and France. We have been featured in major publications and on popular websites including: Your Cat Magazine, Majesteit, Me and My Cat, Breakthrough Radio, Pet Blogs United, Road Tripping Europe, Rascal and Rocco, Curious as a Cathy, The Opinionated Pussycat, This Little Space of Mine, A Fresh Start on a Budget, The England Daily, Everything Everywhere, Angelique Jurd, Bleue Comme Aby, Cat Lady Confidential, My Flagstaff Home, Oh My Heartsie Girl, A Rolling Crone, and Faces & Places. In 2014, Traveling Cats won the BlogPaws Nose To Nose Award for best new pet blog and The Bloggers' Lounge Best Blog of the Year Award. Congrats on your award! I took lots of pics and have a couple of you. Let me know if you'd like them. Can you share it with your reader?